When I was younger, one day my father came to me and he gave me a little charm. For me, it was turtles that were special, and the charm he gave me had a turtle on it and you could tell he'd picked it out just for me and that it meant something special between the two of us. With this event in my past in mind, I designed this handmade Christian charm for another father to give his daughter on a day that's special, or a time in their lives when he felt proud and happy and wanted to share this with her. 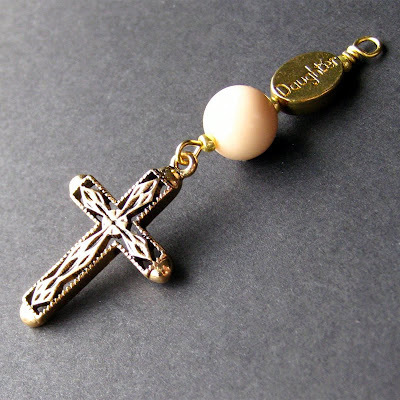 This beaded Christian charm is 2.36-inch (6 cm) in length and created with an intricate gold plated filigree cross joined with cream and gold beads and a brass accents stamped with "daughter". It's the perfect size for adding to a cell phone, zipper pull, key chain, purse, backpack or set to dangle from a car's rear view mirror.